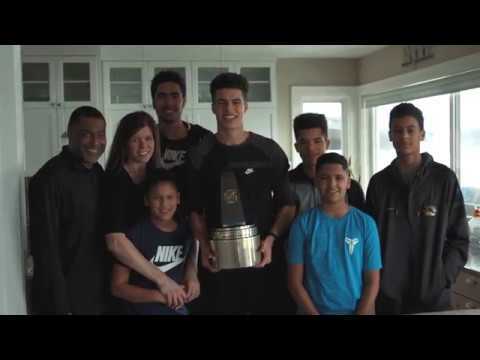 Gatorade® National Boys Basketball Player of the Year: Michael Porter Jr.
SEATTLE, March 22, 2017 /PRNewswire/ -- In its 32nd year of honoring the nation's best high school athletes, The Gatorade Company today announced Michael Porter Jr. of Nathan Hale High School (Seattle, Wash.) as its 2016-17 Gatorade National Boys Basketball Player of the Year during a surprise at his home. The award, which recognizes not only outstanding athletic excellence, but also high standards of academic achievement and exemplary character demonstrated on and off the court, distinguishes Porter Jr. as the nation's best high school boys basketball player. A national advisory panel comprised of sport-specific experts and sports journalists helped select Michael from nearly 540,000 high school boys basketball players nationwide. Michael is now a finalist for the prestigious Gatorade Male High School Athlete of the Year award, to be presented at a special ceremony prior to The ESPY Awards in July. The 6-foot-9, 225-pound senior forward and guard led the Nathan Hale Raiders to a 29-0 record, a No. 1 ranking in USA TODAY's Super 25 and the Class 3A state championship this past season. Porter Jr. averaged 36.2 points, 13.6 rebounds, 5.0 assists, 3.2 steals and 2.7 blocks per game. A member of the USA Basketball Men's U18 National Team, he has been chosen to play in the McDonald's All-American Game, the Jordan Brand Classic and the Nike Hoop Summit. Porter Jr. is also ranked as the nation's No. 1 recruit in the Class of 2017 by ESPN. He has volunteered locally on behalf of his church's youth ministry and youth basketball programs and has maintained an A average in the classroom. "Michael Porter Jr.'s extreme versatility – including his length, skill and athletic ability as a perimeter player – make him standout," says Paul Biancardi of ESPN Basketball. "His jump shot is his calling card, and he already has NBA range and accuracy. He displays the uncanny ability to make tough shots look easy. Equally impressive is his dribble-drive or post-up game as well as his consistency on the glass. What made him truly special this year was the ability to deliver high-level performances against the nation's best." Porter Jr. remains undecided upon a collegiate destination. "Without question, Michael is deserving of recognition as the nation's best high school boys basketball player based on his statistics on the court and the impact his accomplishments have had on Nathan Hale's success," said Gatorade Senior Vice President and General Manager Brett O'Brien. "He is also a shining example to peers and aspiring young athletes of what a leader and a student-athlete should be. He represents everything we hope for in a Gatorade Player of the Year recipient." As a part of Gatorade's cause marketing platform "Play it Forward," Porter Jr. also has the opportunity to award a $1,000 grant to a local or national youth sports organization of his choosing. He is also eligible to win one of twelve $10,000 spotlight grants for his organization of choice, which will be announced throughout the year. The Gatorade Player of the Year program annually recognizes one winner in the District of Columbia and each of the 50 states that sanction high school football, girls volleyball, boys and girls cross country, boys and girls basketball, boys and girls soccer, baseball, softball, and boys and girls track & field, and awards one National Player of the Year in each sport. The selection process is administered by the Gatorade high school sports leadership team in partnership with the Gatorade Player of the Year Selection Committee, which work with top sport-specific experts and a media advisory board of accomplished, veteran prep sports journalists to determine the state winners in each sport.